Kiam Yoong - Low 3-drawer cabinet. 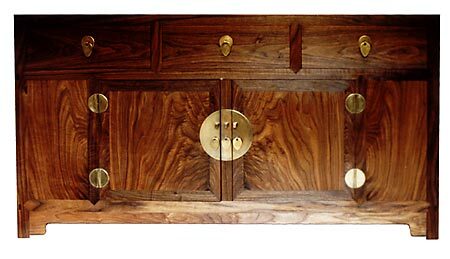 Using similar joinery techniques as the large square corner cabinet, it attracts similar virtues. The wood radiates from the centre of the cabinet to form a completely book-matched scene. The depth and richness of the wood can only be appreciated in real life. All metal harware are made by Kiam.